Every year dentists place over 5 million dental implants for lost teeth, often removing the problem tooth and installing the implant at the same time. But getting a “tooth in a day” depends on a number of health factors, especially whether or not there’s adequate bone available for the implant. Otherwise, the implant’s placement accuracy and success could be compromised. Bone loss can be a similar problem when a tooth has been missing for a long period of time. If this describes your situation, you may have already lost substantial bone in your jaw. To understand why, we need to know a little about bone’s growth cycle. When bone cells reach the end of their useful life, they’re absorbed into the body by a process called resorption. New cells then form to take the older cells’ place in a continuous cycle that keeps the bone healthy and strong. Forces generated when we chew travel through the teeth to the bone and help stimulate this growth. But when a tooth is missing, the bone doesn’t receive this stimulus. As a result, the bone may not replace itself at a healthy rate and diminish over time. In extreme cases, we may need to consider some other dental restoration other than an implant. 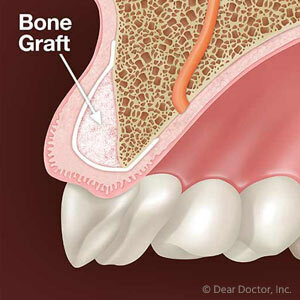 But if the bone loss isn’t too severe, we may be able to help increase it through bone grafting. We insert safe bone grafting material prepared in a lab directly into the jaw through a minor surgical procedure. The graft then acts like a scaffold for bone cells to form and grow upon. In a few months enough new bone may have formed to support an implant. Bone grafting can also be used if you’re having a tooth removed to preserve the bone even if you’re not yet ready to obtain an implant. By placing a bone graft immediately after extraction, it’s possible to retain the bone for up to ten years—enough time to decide on your options for permanent restoration. Whatever your situation, it’s important that you visit us as soon as possible for a complete examination. Afterward we can assess your options and hopefully come up with a treatment strategy that will eventually include smile-transforming dental implants. If you would like more information on obtaining dental implants, please contact us or schedule an appointment for a consultation.